Proper nutrition can make a huge difference in how a person with Hashimoto’s can feel. The Root Cause Green Smoothie is packed with nutrition for your thyroid and helps to reduce inflammation and can help with detoxification. Most of my clients with Hashimoto’s present with food sensitivities, poor digestion, and blood sugar abnormalities, which can perpetuate thyroid autoimmunity as well as cause many unpleasant symptoms like anxiety (especially due to gluten and blood sugar issues), fatigue (all of the above, but poor digestion is especially a huge factor), breakouts (often related to dairy, nuts, or eggs), as well as weight gain. Not many people are aware, but food sensitivities can cause gut inflammation, preventing us from properly absorbing nutrients from our food, and thus putting the body in a “conserve” and “hold onto resources” mode, leading to weight gain or weight loss resistance. Many people with Hashimoto’s are sensitive to gluten, dairy, soy, and sometimes even eggs! This takes many popular breakfast options off the plate and can make breakfast meals challenging. Before I realized that dairy was causing me to have severe reflux, I had a smoothie every morning filled with “healthy” whey protein and Greek yogurt. Within three days of cutting out dairy and gluten, my acid reflux, bloating and irritable bowel syndrome vanished! I didn’t know what to eat for breakfast, so I began to have rice cereal with rice milk every morning. Gluten free and dairy free, right? While the reflux was gone for good, I quickly found myself being “hangry” (hungry +angry), due to blood sugar swings and found that my thyroid antibodies more than doubled—blood sugar swings can worsen the autoimmune attack on the thyroid gland! It wasn’t until a few months later that I began to think back on the breakfast smoothie. I was taking a certification course for pharmacists in Advanced Diabetes Care, where I learned about the effects of proteins, fats, and carbohydrates on blood sugar. Fats slowly raise blood sugar and keep it stable for up to 4 hours; proteins cause it to rise a little faster, and keep blood sugar stable for 2-3 hours. Carbohydrates, on the other hand, raise our blood sugar quickly, and one can see a decline in blood sugar in as little as 30-60 minutes (assuming the same amount of each eaten) after eating carbohydrates. I realized that while the dairy based smoothie was horrible for my reflux, it did a better job of stabilizing my blood sugar due to protein and fat content, while the carb-rich rice cereal and rice milk sent me on a blood sugar roller coaster. I set out to find a comparable protein that I could use in my smoothies and came across egg white protein. I enjoyed the taste of the egg white protein, but it made me bloated. Testing showed that I became sensitive to eggs (a common reactive food in Hashimoto’s), so I had to continue to search for alternatives. I then came across pea protein, which removes the carbohydrate component of the peas, leaving just the protein. 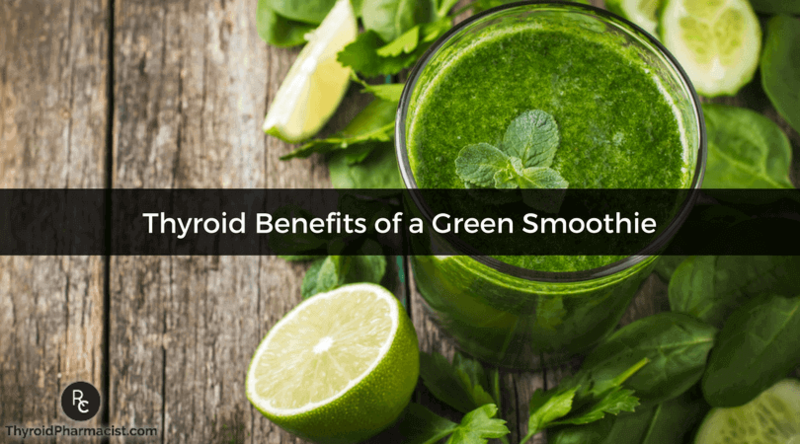 This green smoothie is packed with nutrition for your thyroid, helps to reduce inflammation and can help with detoxification. It combines a hypoallergenic protein source with fat (from coconut milk) and fiber from veggies. As the smoothie is blended into tiny particles, it is much easier to digest compared to a regular breakfast for people who have digestive issues (always “chew” the smoothie anyway, to help activate your digestive process), making the nutrients more readily available and leaving them with more energy. The base of coconut milk is a hypoallergenic source of fat and can help reduce inflammation and stabilize blood sugar due to its (good) fat content. Adding an avocado increases the fat/blood sugar stabilizing content, and gives the smoothie a “pudding” like consistency. Veggies add fiber and micronutrients which are more readily available due to using a blender to break the fiber and nutrients apart. Sea salt (added to taste) can help with supporting the adrenals, which are often stressed in people with Hashimoto’s. People who have tried the “Root Cause Green Smoothie” have said that it helps them feel less hungry, more relaxed and calm, and gives them plenty of energy. If needed, you can even double the recipe to make enough for lunch! ***If you are sensitive to peas, or following the Autoimmune Paleo Diet, I have created the AI Paleo Protein™ by Rootcology—made with hydrolyzed beef! Hydrolyzed beef is the only Autoimmune Paleo friendly protein on the market and it tastes delicious!! While most people who have tried the green smoothie love it, there are some people (ahem, my husband Michael) who may not like the pudding-like texture/consistency and the warmth of the smoothie. In his case, he prefers the smoothie to have a thinner, milk-like consistency, and he also prefers it to be “cold and tropical tasting” (his words :-)). While the carrots and coconut are usually naturally sweet enough, if you are coming off the Standard American Diet, you may want to add a boost of fruit, like a ¼ cup of berries or ½ green apple as your taste buds transition to appreciating the natural sweetness in coconuts and carrots. Blend in Vitamix or other blender and enjoy as low glycemic breakfast, lunch or snack! Try out the Root Cause Green Smoothie for a few days, and let me know how you like it! If you’re looking for more healing recipes, you can buy one of the Rootcology protein powders today and receive a FREE copy of my Root Cause Smoothies eBook! In it you will find twenty smoothie recipes that will satisfy your taste buds while also helping you to feel better! Wishing you all the best on your thyroid journey! P.S. To learn more about other helpful interventions, please consider joining my Hashimoto’s Self-Management Program or pick up a copy of Hashimoto’s Protocol: A 90-Day Plan for Reversing Thyroid Symptoms and Getting Your Life Back and Hashimoto’s Thyroiditis: Lifestyle Interventions for Finding and Treating the Root Cause. P.P.S. I hope you get a chance to try the Rootcology protein powders and enjoy my Root Cause Smoothies eBook! Note: Originally published in July 2015, this article has been revised and updated for accuracy and thoroughness. Our green smoothie is delicious – we have 2 sticks each of kale, celery, silver beet, 1 x apple and banana, a few pieces of frozen mango, chia seeds, mint and ginger every morning. I think we are addicted as when we go away we really miss it! Judi- Yum!! You may be interested in checking out the Root Cause Recipe Portal. It is full of autoimmune paleo and paleo recipes. You’re able to organize weekly shopping lists, meal planning, etc. Hope you check it out. Thank you, Dr. Izabella. I will check that too! Can I substitute almond milk in place of coconut milk in your Basic Smoothie Recipe? Also, a lot of recipes call for coconut flour or coconut milk. What do you suggest for substitutes for those. I did the Alletess test and I am unable to have coconut. Dale – thank you for reaching out. You can use another nut milk of choice (such as almond milk) or filtered water. The fat content will be significantly lower if you are not using canned coconut milk, so potentially adding another fat, such as avocado oil or olive oil may be beneficial. You would want to add 1-2 tablespoons of the added oil. I really love this smoothie! just wanted to know how often I should have it, Is it ok to have everyday or should I have it a few times or week? Also is it better to use can coconut milk or the container? Since drinking this smoothie my skin, hair, and over health has improved 100%! Lakisha – thank you so much for sharing! I am so happy you are enjoying the smoothie and seeing such wonderful benefits. <3 Yes you can have one every morning! I recommend coconut milk that is free from additives, gums and sugar; and is organic if possible. Some great brands that you could look for are Native Forest & Trader Joe’s (always check the ingredients as the ingredients used could change). My TSH, T3 and T4 have come back elevated and I can’t get in to the endo til January! I can’t seem to find any info on what would cause all 3 to be high. I have to say, this has me concerned. Any ideas? Marna- Did you know that reactive foods trigger an inflammatory response in the GI tract, leading to malabsorption of nutrients (gluten sensitivity in particular has been implicated in causing a Selenium deficiency, a well known risk factor for Hashimoto’s), and can also produce intestinal permeability whenever they are eaten? I wish I could eat pea protein but I am allergic to peas too!! I’m also allergic to brown rice too. Not sure about hemp protein powder as the allergy test didn’t test for it. Melissa- I am so sorry to hear that. Most people will see a dramatic reduction in gut symptoms, brain symptoms, skin breakouts and pain by eliminating the foods they are sensitive to. Some will also see a significant reduction in thyroid antibodies! An additional subset of people, will actually be able to get their Hashimoto’s into complete remission just by getting off the foods they react to, normalizing their thyroid antibodies, and some even normalizing their thyroid function! Here are a couple of articles you may find helpful. What kind of baby greens do you use that are thyroid friendly? I have sued some parsley from my garden, cucumbers or avocado. I steered away from kale, spinach and the Swiss chard I used to use due to what I read about their negative effect on the thyroid. I make a smoothie each morning using kefir I made from my home made coconut milk. I add some blueberries, mango, cranberries, carrots, sweet potatoes or pineapple in various combos along with some coconut oil/cream, a scoop of Vital Proteins Collagen Peptides, cardamom, ginger and cinnamon. Because we have an RO filter I also add some liquid mineral supplement. What do you think about the effects of the “anti-thyroid” greens? Can you suggest other greens that would be more thyroid friendly? WHAT ARE GOITROGENS AND WHY DO THEY MATTER WITH HASHIMOTO’S? I eat spinach raw and cooked all the time. What are the negative effects? I am allergic to coconuts, almonds and soy. What should I substitute the coconut with water? I am heading out to buy a nutribullet to incorporate these shakes into my diet. I have hashimotos, although my TSH is within normal range, my tpo antibodies are 93. some IBS conditions, looking forward to trying your recipes! Another hurdle, I have Hashimoto’s and recently had allergy testing done and found out that I am allergic to peas and squash. Any ideas on what I could replace the pea powder with for this green smoothie? Thanks! Pat- You may be interested in checking out the Root Cause Recipe Portal. It is full of autoimmune paleo and paleo recipes. You’re able to organize weekly shopping lists, meal planning, etc. Hope you check it out. What would you suggest using in place of coconut milk if you have a coconut allergy? I am tired of losing my hair. So I think I better try this. Carol- Hair loss is a distressing symptom experienced by women with Hashimoto’s. For women, our hair represents our femininity, and losing our hair is a constant reminder that something is off and that we are not well. Have you read these articles? Myrtle- You may be interested in checking out the Root Cause Recipe Portal. It is full of autoimmune paleo and paleo recipes. You’re able to organize weekly shopping lists, meal planning, etc. Hope you check it out. This sounds delicious, and the fact that it’s good for your thyroid just sweetens the deal! Thanks for sharing this recipe! Jordan- You may be interested in checking out the Root Cause Recipe Portal. It is full of autoimmune paleo and paleo recipes. You’re able to organize weekly shopping lists, meal planning, etc. Hope you check it out. I use frozen vegetables that way the drink comes out cold but great recipe and thanks for all the tips! Aileen- You may be interested in checking out the Root Cause Recipe Portal. It is full of autoimmune paleo and paleo recipes. You’re able to organize weekly shopping lists, meal planning, etc. Hope you check it out. I have been having this type of breakfast for a few years. Also been using pea protein, but even if not allergic to it, it is a good idea to rotate it with another type of protein or two, to avoid becoming sensitised to it. My other protein types are hemp and one derived from sunflower seeds (great for a cacao-based smoothie). I no longer use kale (or spinach -> oxalic acid) in my smoothie raw to reduce any possible goitrogenic or anti-nutritional effect (some people steam them first). My smoothie however includes organic Romaine lettuce as well as organic carrot, half an organic apple and organic celery, rosehips powder plus whatever herbs (and berries) I have available. To finish, I add adaptogen herbs and a green powder (mix of spirulina, chlorella and similar). For fat: avocado or coconut or soaked nuts (almonds etc) or seeds (flaxseed, chia, pumpkin seeds). This keeps me going for hours. CIS- You may be interested in checking out the Root Cause Recipe Portal. It is full of autoimmune paleo and paleo recipes. You’re able to organize weekly shopping lists, meal planning, etc. Hope you check it out. I am under the impression that spinach and kale as well as chia seeds are not recommended with someone with Hashimotos. Can you give me some information on this. Anne – thank you for following this page. Here are a few articles related to diet that hopefully help you get started. Geraldine – thank you for following this page. Unfortunately, we do not currently sell or ship outside of the United States due to complicated regulations. I hope that the above helps! Thank you for your interest in Rootcology supplements. People with leaky gut can become allergic to anything. I have been allergic to both coconut and avocado. I think right now I’m not and hopefully my gut is finally healing though I am still allergic to many things. Not much is really hypoallergenic. Maybe rice. I alternate between rice and pea protein these days. Mary – thank you for following this page. Here is an article you might find interesting. Hello Isabella, Thanks for all the information. I am currently taking Nature-throid for hypothyroidism. A recently allergy test shows that I have a mild allergy to pork. Could this be reason of my hives and rashes also? Edy – thank you for following this page. Here is an article which you may find helpful. I can’t use the proteins you recommend. I will try the recipe with organic pumpkin seed powder. Omega Nutrition makes an excellent protein powder, etc. Heidi – thank you for following this page. I regret that I do not have the time to evaluate every supplement on the market. As a pharmacist, I can tell you that many supplements are ineffective, and some are even downright unsafe. The truth is that most supplement companies do not undergo the same scrutiny and testing that pharmaceutical products do. This is because many of the tests required of pharmaceutical companies are voluntary for supplement companies and most companies do not take the extra steps to test their products to ensure safety and purity. Rootcology’s mission is to provide safe and effective supplement solutions for people struggling with autoimmune thyroid conditions. Rootcology supplements are composed of high-quality premium, gluten, dairy, soy, pesticide, and toxin-free ingredients and undergo third-party testing to ensure that the ingredients on the label match the ingredients inside each bottle. Here is a link to the site. https://www.rootcology.com/collections/supplements I hope you check it out! I’m vegetarian.I live in India.. I have hypothyroidism. Which legumes are recommended ,which are soy based? Yvonne – thank you for following this page. Most people will see a dramatic reduction in gut symptoms, brain symptoms, skin breakouts and pain by eliminating the foods they are sensitive to. Some will also see a significant reduction in thyroid antibodies! An additional subset of people, will actually be able to get their Hashimoto’s into complete remission just by getting off the foods they react to, normalizing their thyroid antibodies, and some even normalizing their thyroid function! Here are a couple of articles you may find helpful. Great recipe! Do you drink the whole thing in one sitting? I drank it all but am uncomfortably full. Just curious. Thanks! Heather – you are very welcome. I am so happy you liked it. 🙂 If it fills you up you could try splitting it and having the other half at lunch! Erica – thank you for following this page and for sharing what has worked for you! The selenium content of Brazil nuts is determined on the soil where the nuts are grown and can vary 10 fold depending on the origin of the nuts. Brazil nuts can have between 50-500 mcg of selenium per ounce of nuts, so unless a lab has analyzed the micronutrients, you really don’t know if you are getting enough or too much selenium. Additionally, many people with Hashimoto’s may have multiple protein sensitivities and may be sensitive to Brazil nut. Here is an article you might find interesting. I purchased your book and have been following you to put the pieces together that will work for me. I have adrenal issues (waiting 2 months for an appt with endo) and would like to try your Root Cause smoothie. The issue I have is that green leafy vegetables make me very sick…. as if I have a serious stomach flu. Is there a substitute I could use until the adrenal issue is addressed? The greens are also a problem for me following your diet. How do you feel about hemp protein powder for Hashimoto’s? Madelyn – thank you for following this page. Some people have found that they tolerate pea protein, hemp protein, and chia protein well. I recommend ALCAT testing to figure out your unique sensitivities. Here is an article you might find interesting. but is it okay to eat an avocado every single day? Or this is just a three day option? Marian – thank you for following this page. Please contact my team at info@thyroidpharmacist.com and they will be happy to help you. Is there a specific brand of coconut milk you recommend? I noticed that the refrigerated ones have a good amount of added ingredients but I am also concerned about the linings used in canned coconut milk. Marina – thank you for following this page. I’ve found the Trader Joe’s brand to be great (when it’s in stock). I also really like the Aroy-D brand, which you can get on Amazon. Look for one that is free of additives and carrageenan. I was going to mention the coconut milk, but you beat me to it. You might want to note that in the top recipe section. ALL of the ‘boxed’ or carton milks are full of strange chemicals, and only some of the canned milks are free of artificial additives. Just because it’s sold in a ‘health food store’ doesn’t mean that it’s actually healthy. Read the labels, folks. I’m laughing because your green smoothie recipe is virtually identical to mine, but I add about 1/4 to 1 tsp each of turmeric, Chinese ginger, fresh garlic, star anise (just a pinch) and ground cardamom, as well as sea salt and fresh ground black pepper. The spices are both for flavor and for the anti-inflammatory properties, and I mix them up and add others depending on my mood that day. I’d been an organic vegetarian for a couple of decades before changing to the AIP in June, so I have a *bit* of experience with green smoothies. 😉 Some will recognize that spice blend as a variant of a masala mix for chai. Now that I’m a ‘reformed vegetarian’ I also add 1/4 to 1/2 cup of organic bone broth to the smoothie mix. I have lyme disease so am minimising as much sugar content as possible. What substitutes would you suggest for the carrot and coconut oil? If you have any thoughts on cause of bloating please let me know! Neeve – thank you for following this page. Everyone is different and you may need to adapt your smoothie to your own sensitivities. Here are a couple articles you might find helpful. This recipe calls for one whole avocado. I know that they are a healthy monounsaturated fat. Having said that, will eating one whole avocado lower your LDL and raise your HDL? Also, a whole avocado is very high in calories. Will eating this shake daily help with weight loss? I have been adding a beet to mine along with other veggies like, Cauliflower, beet greens and asparagus. It takes me a little over an hour to eat this shake! I feel so good after that eating it. Thank you for sharing the recipe!! I have shared it with many people. I believe this shake can benefit all people, not just those who have Hashimoto’s. Angela – you are very welcome I am happy you like it! <3 Remember everyone is different so you may need to adapt your smoothie to your own sensitivities. Here are a couple articles you might find helpful. I just purchase your book and have been reading some of your emails. I have been told just recently that I have Hashimoto. But my husband has a fatty liver and he gets sharp pains from it, but the doctor say he need to diet or have a surgery to cut half the stomach. No way baby he says LOL. Anyway do you think that the thyroid diet will help and benefit him. Milagros – thank you for following this page. He likely would benefit from the AIP diet as well as support you at the same time! <3 Did you know that reactive foods trigger an inflammatory response in the GI tract, leading to malabsorption of nutrients (gluten sensitivity, in particular, has been implicated in causing a Selenium deficiency, a well-known risk factor for Hashimoto's), and can also produce intestinal permeability whenever they are eaten? Most people will see a dramatic reduction in gut symptoms, brain symptoms, skin breakouts, and pain by eliminating the foods they are sensitive to. Some will also see a significant reduction in thyroid antibodies! An additional subset of people will actually be able to get their Hashimoto's into complete remission just by getting off the foods they react to, normalizing their thyroid antibodies, and some even normalizing their thyroid function! Here are a couple of articles you may find helpful. 1) Why did you choose each ingredient you did for your Green Smoothie recipe–what does each ingredient bring to the whole? As a localvore, gardener, and person very comfortable in the kitchen and on a very limited income, I would like to be able to make substitutions to the smoothie recipe that will not significantly reduce the benefit it can bring to my body. 2) Giving up gluten as my naturopath recommended has been a blessing in terms of getting rid of the migraines I’ve had since childhood and the wicked acid reflux I had begun to experience. However, it’s only been in the last few months that I’ve realized that my lack of ability to accomplish what I once did–including around earning a living–along with the fatigue and brain fog, are also a result of autoimmune disease, and I clearly I must do more. I am prepared to go with the AIP diet, but I am curious about coconut–how does it fit in, since it is a nut? Hi Dr. Wentz. Quick question, I’m wondering why sea salt for this recipe? I thought hypo patients were supposed to avoid sea salt since there body needs iodine as is found in iodized salt. Thoughts? Linda – Thanks for reaching out! I’m very hesitant in recommending iodine in Hashimoto’s. Although iodine serves as fuel for our thyroid and is very important in iodine deficiency hypothyroidism, Hashimoto’s is a different mechanism. It’s like pouring gas into an engine that’s on fire… that’s essentially what’s happening in Hashimoto’s thyroid inflammation. Adding iodine to the mix before putting out the fire and fixing the engine may result in further damage to the thyroid. In those with a predisposition to autoimmunity, this has been documented time and time again, in both animal and human studies. I haven’t gotten the pea protein yet, so I am supplementing my smoothies with other protein in the morning (an egg, nut butter, meat), but I am finding that one batch lasts me for hours because it feels so filling! Not even hungry again in a reasonable time for lunch! Your recipes include other types of breakfasts, and I am wondering if you have the smoothie every morning or if you mix it up with other things from day to day. Rosemary – Thank you for asking about me and my smoothie! My diet is very customized. I follow a Paleo diet and avoid any personal food triggers that I have discovered by going on an elimination diet. Here is some information you may find helpful. Hello! I am vegan and use Vega pea-based protein powder. This is not a thyroid triggering source of protein, correct? I am very pleased to have found your website and FB page. Follow-up question: Is it absolutely necessary to use animal products to be healthy? I am unable to follow a Paleo diet for ethical reasons. Thanks! Heidi – thank you for following this page. Recovering from adrenal fatigue and hypothyroidism when following a vegetarian diet is very challenging, as vegetarian diets are often carbohydrate heavy. Vegetarian sources of protein such as legumes (beans), dairy, grains, soy and some seeds may be incompatible with trying to heal a leaky gut, which is almost always present with Hashimoto’s. Pea protein is an alternative that may be easier to digest and is less likely to cause food sensitivities. Additionally, many former vegans have reported improved symptoms of Hashimoto’s following transitioning to a Paleo diet. Based on this, I believe that animal proteins must play an important role in building back the health of people with Hashimoto’s. That said, while meats and fats are important for healing, eating them exclusively will produce an acidic environment in the body, hindering healing, and thus the diet should be balanced with plenty of nutrient rich vegetables (suggested ratio may be 20% meat/80% veggie). I have started drinking this smoothie. It tasted amazing and keeps me full for hours. I am adding in a scoop of collagen peptides and a spoonful of flavored fish oil. Is it ok to do this as long as I wait an hour after taking synthroid or do I need to wait longer to avoid interfering with absorption? Thank you for this info. I love starting my day with a green smoothie and when I travel and I am unable to make a daily green smoothie I feel super sick. Do you have any green drink products that you recommend? I would love to have something that I can take with me when I am away from home. Ashley – thank you for sharing! I LOVE the green smoothie too! <3 Please email my team at info@thyroidpharmacist.com and they will be happy to help you with this! I’m on the AIP Diet & just bought a jar of Organic Beef Bone Broth from Natural Force. Can I use it in this recipe until I can buy the AI Paleo Protein? Jann – thank you for reaching out! Unfortunately, I am not able to evaluate every supplement on the market. As a pharmacist, I can tell you that many supplements are ineffective, and some are even downright unsafe. The truth is that most supplement companies do not undergo the same scrutiny and testing that pharmaceutical products do. This is because many of the tests required of pharmaceutical companies are voluntary for supplement companies and most companies do not take the extra steps to test their products to ensure safety and purity. I have created my own supplements brand, Rootcology, to provide safe and effective supplement solutions for people struggling with autoimmune thyroid conditions. These supplements are composed of high-quality premium ingredients which are gluten, dairy, soy, pesticide. and toxin-free and undergo third-party testing to ensure that the ingredients on the label match the ingredients inside each bottle. Here is a link to the website: https://www.rootcology.com/collections/supplements. I hope this helps! I thought maca root powder wasn’t good for those with Hashimoto’s?? Diane – thank you for reaching out. Maca is an adaptogen and can help to stabilize the adrenals. However, it may have different effects on different people. Start with 1 teaspoon to determine how you tolerate it, and work your way up to the recommended 1 tablespoon in the Maca latte recipe. I hope that’s helpful. Hello, I know to avoid certain foods but aren’t some baby greens goitrogenic?